The Brooklyn Museum has a history of being a well-to-do art museum as any other, dedicated to it’s own specialities of permanent collections and installations. However that image greatly changed when in 1999 Charles Saatchi’s controversial Sensation exhibition brought a court order to the museum the likes of which had not been seen in contemporary art for a long time. Chris Ofili’s The Holy Virgin Mary caused major outrage between NYC’s then-Mayor Rudy Giuliani and the Museum, bringing the art world to a stand-still regarding imagery, medium and subject matter. Since then, the Museum has still performed a service to the arts in New York City and the world by bringing the first U.S. museum survey of Warhol’s last decade to the public presenting some of his largest scale canvases, collaborations and wide ranges of subject matter. With an accompanying exhibition to further demonstrate his worth to us, the public, it has to be said… our worth to him was very high, showing a fascination with popular culture that became a basis for his own Pop Art. 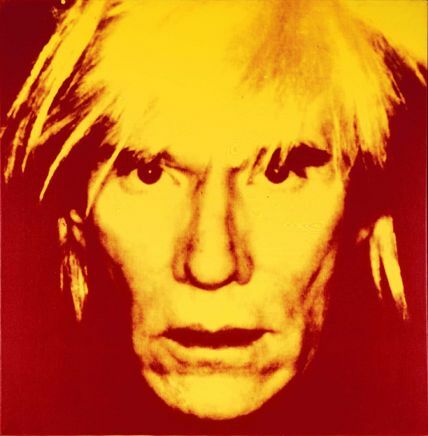 Around the time of his last ten years on this earth, Warhol (1928-1987) showed a transformation that had many-a-critics discouraged but an artist with an idea and radical way of thinking always wins. If we refer to his series of religious work which dictated his beliefs and hidden personal life (as if he didn’t have one!) and his development into abstraction, bringing his signature Pop to other trendy art movements in America. An excellent selection of work; printed, painted, filmed and other; make this an excellent exhibit for the most independent or mainstream art student, showing Warhol’s descent into avant-garde styled art such as urinating and painting with metallic paints onto canvases in his Oxidation series. Or perhaps it was Warhol’s Shadow series that displayed his own interpretation of this Abstract Expressionist art movement that he was envious of and parodied. At the same time, there is evidence of a hidden envy towards the likes of Jackson Pollock in the Yarn paintings that are as playful as his Eggs paintings, finding a way to joke about Piet Mondrian and others from the Neo-Plasticism and non-figurative era. By the time we reach the second part of the exhibit, we are further enticed by his massive canvases and collaborative pieces with Jean-Michael Basquiat and Francesco Clemente as well as Warhol’s final silkscreen paintings. The Rorschach paintings provide a greater insight into Andy’s psyche on a size that rivals one-storey bungalows whilst his black-n-white TV styled silkscreen paintings are his interpretation of media, a favourite subject, with varying sizes. Lest we forget his Camouflage works which merged with some of his latter mentioned pieces, witnessing more of his proposed Abstract art. By now, Warhol had swapped his earlier Pop subjects of celebrity and media for Abstract art and that brought about what some would regard as his best representation of his energy, vitality, experimentation. The collaborative pieces are now rare as they encompass the collective effort between three of the art world’s ‘modern-esque’ artists. One thing to take away from this exhibition is therefore the ability to revolutionise. European contemporary arts practitioner who paints. Loves cinema and philosophy. All opinions are et cetera et cetera. Currently working in London.